In discussing a mobile app with a customer recently, I came to realize that people are having a difficult time in trying to develop a mobile presence. The huge increase in the smart phone market has left many trying to figure out how they can connect best to their mobile customers. I can still remember looking at the Google Analytics report for one of our large clients and seeing big increases in mobile access to their website. We found that from Thursday through Sunday, there were huge increases in mobile traffic. Upon further investigation we found that people were browsing the pages with directions and pages that had their menus. The client had toyed with the idea of a mobile site for a while and after seeing this they were jumping at the chance to go mobile. If you haven't found a need for a mobile presence, you probably aren't looking hard enough. Trust us, you need one but how should you reach your mobile customers? Will you build an app and if you do which platforms will you build it for? What about a mobile site? How much will all of this cost? There are many difficult questions that will come up and all of them will cost you money. There are seemingly endless options. A few years ago everyone would have told you to build an Iphone app. Iphones were trendy and much more consumer friendly than Blackberry devices. Mobile websites back then lacked substance and in many cases were more difficult to navigate and use than their full size counterparts. Today, mobile sites are much more versatile and in many cases rival the quality you can achieve with an app. Ultimately you need to know what your clients use and what is the most effective way to reach them and then weigh those factors against how much money you are willing to spend. There is no silver bullet at this point but mobile web pages are currently the best way to reach the most people for the least cost. We get asked regularly by our clients how they can get people to interact with their social media accounts. Simple answer, it depends. The best way to get people engaged online is to find out what engages them in real life. People go to social media accounts because they have some interest in what you do. First and foremost, keep your accounts active. People follow accounts that are dynamic and interesting. Nobody wants to follow a stagnant account that hasn't been updated in months. Another really simple technique is to create some sort of actionable post. A contest is a great way to get people engaged. It can be a simple trivia question about your history or the history of where your located. You can also give things away to the winners like merchandise with your logo or a coupon. Most of you have likely noticed that Facebook has switched over to it's new Timeline style pages. A lot of people are having trouble understanding the value of this. You have lost the ability to direct people to your landing page which means it's no longer technically a "landing page", and instead is simply a Facebook tab. The big advantages we have found are the cover photo. This is a big space that you can use to grab peoples attention. You can put a catchy photo, a branded message, etc...but you can change this regularly and it's easy enough anyone can do this. The other neat feature is the actual timeline. You can add events that have occurred throughout your business' history. It has a lot of potential to grab peoples attention and get them to follow you. How Do Websites Fit Into Today's Internet? There are a lot of ways for you to get your influence out on the internet. Originally, we had simple websites and email. A website in the early days of the internet was nothing more than some really basic graphics and text. It was informational and not really a means to connect with anyone. That has changed dramatically and continues to evolve thanks to social media and other web based technologies. The question becomes how do you use your website today? It's still essential to have a website. You can get by without one by utilizing your social media as your main online presence but it's still very difficult to get everything done online without the use of a website. What's changed is how you use your website. Originally the website was your end all be all online persona. Today you can think of your website as your hub. It is the intial point of contact and from there you can direct your online visitors to all of the other online platforms you can be found on. For instance, someone finds your website and realizes you only have a website. They are in a pull demand situation. It's up to them to pull info from you online and it's up to them to visit the site and see if there are any updates. If they want your contact info or want to see projects your working on, they have to visit the site and find them. Now if that person goes to your website and sees that you have a facebook page and they join it, you have created a push demand info. You can post to your facebook page and they will see that info because it's automatically put into their timeline. They will see you even if they aren't looking for you. To take this a step further, you can create a network of online systems. Connecting your website, blog, facebook, twitter, youtube, etc.... together unifies everything while allowing people to pick their online source of choice. Some people only use a single social media account, maybe only facebook. Others use lots and may miss your message on one system and catch it on another. When we post to our blog or facebook, it automatically goes to our twitter account for instance. The goal is to get your message across all of the platforms that your clients use. The website is still critical and proper design and good content will keep people coming back but social media, blogs, and other web technologies allow for a custom fit for each visitor and it will keep your online persona dynamic. In cold winter weather you often daydream about summer. Today the snow had me thinking about an ad I produced for North End Repair in the late 90's for Yamaha Waverunners. As I watched I saw as talent two friends Luther Stephney and Bob Ayres. Bob worked at Channel 5 in Plattsburgh for many years and sadly passed away a few years ago from heart failure. Bob was a great guy and is missed. Also on the waverunner is my wife and my niece Sarah. She's living in Alaska now and is a Marine Biologist. She's expecting her first child. The announcer is Don Bazley who nows lives in Ithaca and is the proud new father of "Betty Bazley", born on New Year's Day. My family and friends have always been a great source of "talent" for tv commercials. When you have little or no budget it's the only way to go. When you do have a budget and you need a girl to wear a negligee one source to consider- your local bachelor party planner. That was where we found the young lady in a second North End Repair ad from the year 2000. Finally, since some of my readers are also video producers I'd like to stress the importance of getting image releases. I recently produced an ad and one of the persons in the ad complained to the client that I didn't get a release. I had it, and more importantly found it quickly, putting the matter to rest. If you would like the wording we use for our release please e-mail me and I'd be happy to send it to you. We recently began uploading both new and old tv ads and productions to YouTube. No surprise that a pretty face and the words "plastic surgery" are popular as indicated by the visitors to an ad we produced for Adirondack Plastic Surgery Center. Back in the 1980's when I worked for WPTZ-TV, and lived in Burlington, VT, there was a store called "Gayne's Shoppers World." It was a Vermont version of Wal-Mart. This ad combined some primitive blue-screen work with some even more primitive drawing by yours truly. The actor featured is Jim Gratton, another WPTZ-TV almunus and now you can hear him pulling some shifts for Hall Communications, mostly on WKOL. Today's last look backwards is to 2001 and a take-off on the movie 2001, A Space Odyssey, featuring the further primitive antics of early man. 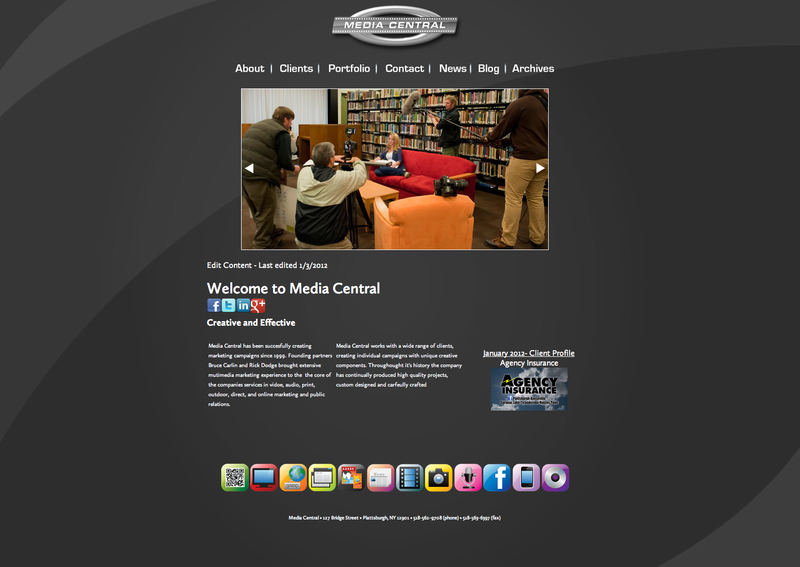 Media Central launched it's redesigned website on January 3, 2012. Nothing is changing faster, nor more exciting than using the internet for marketing and providing services. In the beginning you were cutting edge to get a website and we had to spend time trying to convince clients to get online. Then we moved into the "Well I guess I have to have a website" phase in which companies sometimes basically put up a billboard. Today it's all changed. The Yellow Pages are happily heading to the marketing graveyard. We are building interactive, content-managed websites brimming with social media interaction and being delivered on a smartphone or tablet that customers tune to. There's no turning back the clock, and why would you want to if you could? But wait you can, check out the "Wayback Machine" at http://www.archive.org/. Here you can enter a URL address and see how web design has evolved for a particular company. Sometimes parts of sites aren't there but it's suprising how much lives on. Media Central provides an entire array of web services ranging from design through hosting, call us today if you're interested in improving your online presence and utility. I thought I would take the time to post my thoughts on the last year and the impact of social media on our business. I started with Media Central full time a little less than a year ago. I had dabbled in social media and helping business to get on board with social media but when I came to Media Central they were willing to take the risk and let me specialize in social media development. When I first started to develop what exactly I was going to do to get companies involved in social media, I was a little nervous to say the least. I was taking something that I knew would be great if applied to business but also knew that most of the social media services offered little support or services for business use. This changed drastically over the last year. Facebook has been releasing feature after feature devoted to business use. The change from groups to pages was a big advantage. The results have been great. We have helped around 20 businesses get involved in social media and helped them to develop policies and procedures to help them develop how they will interact with their clients online.